I promise to use it only to send you Warriors Project - Drills & Tips. The samurai sword also called Katana, Tachi, and Daito. is an amazing sword and is one of the martial arts weapons best. It is part of the Nihonto (Japanese sword) family. Together with the samurai, gi, training bare foot…it is one of the most recognized symbols of the Japanese martial arts. The user of the katana as well as its makers are considered master craftsman. Japan has a long history of sword making, dating back even earlier than the 5th century. 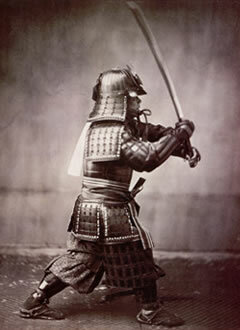 However the production of the samurai sword as we know it began around the 12th century. The resemblance of it suggests that its origins come from the Tangs dynasty’s most popular weapon at the time the Tang blade. However, the Tang blade was not curved. The Katanas curve is said to be of Arabian influence (at that time many merchants from all over the world came to trade inside the Tang Empire). This influence was a welcomed one as it improved the Katanas cutting ability especially in the downward motion. At the end of the 14th century due to the “Tokugawa shoguns regulations”, the katana was effectively standardized. However the 200 years of fighting before had seen a decline in the quality of the swords made as mass production was more important than the quality. As a result some of the old methods of sword making were lost. The katanas made in the years to come were never able to surpass the quality of the old swords. The relatively peaceful times which Japan entered was accompanied by the creation of a higher quality of the katana. They were called Shinto - “new sword”. During the 16th -17th centuries sword smiths tried to rediscover the old techniques as the Shinto blade was stayed inferior to the old Tachi (Koto) blades. This resulted in the re- introduction of old methods of crafting and the making of the Shinshinto – “new revival sword”. Though the Shinshinto are considered to be superior to the Shinto they are still regarded as inferior to the Koto. The Haitorei edict in 1876 which banned the carrying of swords and guns on the streets, caused a mass decline in the needs for swords, and thus many sword smiths were put out of business. Police, however, were still in need of swords, and later on soldiers in the imperial army were also given one. The swords which they used were called Gunto, and they only resembled the tradition samurai sword by appearance but definitely not by quality. Nevertheless there were a few sword smiths which produced quality swords which were refered to as Gendaito. Samurai swords crafted today in traditional method are called Shinsakuto – “newly made swords”. In Japan the katana is considered as an art object rather than a weapon and as such must have the required documents to be properly owned. The making of a samurai sword is considered a sacred art and like most complexly crafted objects is constructed by different crafts man. A samurai sword is made from Japanese steel – Tamahagane – using 2 different types of steel - soft and hard, which creates razor sharpness while allowing for an extremly resilient and shock absorbing blade, which can hardly bend or break. •	Long grip which allows 2 hands to hold it the same time. •	The Scabbard and all which accompanies it which by themselves are considered a work of art and which we will not go into. 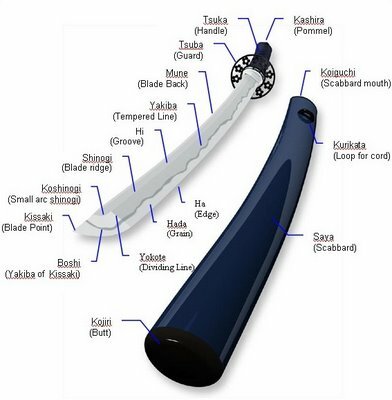 There exist different classifications for the different kind of Japanese sword. These are based on the size of the blade. Normally the length of a samurai sword is around 60 - 70 cm (23.6 - 28 inches) although depending on the time of making they have been made shorter and longer. * When purchasing a samurai sword, among other issues we should be ware that the grip is well fixed to the blade. Usually the tang (the un-edged part of the blade and where the sword smiths signature is on) goes into the grip (the grip is usually longer than the tang) accompanied by a wooden piece which comes out of the tang. This wooden part helps to firmly connect between the blade and the grip. When buying a replica, which usually looks real, the connection between the grip and the tang is not done properly making the actual use of the sword become extremely dangerous. In the martial arts theory article we covered how a martial art builds itself. It is interesting to understand how the characteristics of the katana influenced the techniques it applies. One clear example, the fact that upon clashing with another katana blade the blades would often split and or break. The samurai sword is a craft of its own. Making it is not less of an art than learning it. It is a weapon so well designed that one must carefully train with it as well as use it.